This three Part tribute to Karate Master Shoji Hiroshi is the first in our Karate Legends Series. Part 1 was written by his student and friend T. Nishimura a former JKA instructor in Melbourne Australia. Part 2 is the preface to the Shotokan Karate Kata textbook “Unsu” (1976) featuring Shoji Sensei as demonstrator. It was written by one of the most influential figures in Shotokan Karate History - M. Nakayama Sensei late JKA Chief Instructor. Part 3 was written for the same book by Hidetaka Nishiyama Sensei, another renowned JKA Karate Master. This will give you an insight to the character and incredible ability of one of Japan’s true Karate legends. The only man ever to achieve a perfect "10" score in the history of the All-Japan Karate Championships. 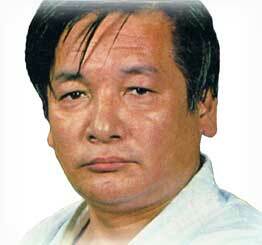 On Saturday 1st November 2003 I received a call from Japan that Shoji Sensei had passed away. He was 72 years old. I have many memories of him spanning nearly 40 years. When I joined Chuo University Karate Club, our instructor was Masataka Mori (a JKA Karate master now residing in the US). His training was hard, we were all scared of him. 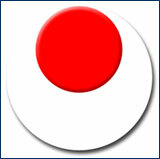 For grading exams Mori Sensei always brought another smiley instructor with him - Hiroshi Shoji Sensei. When we learned that Mori Sensei was leaving Japan we 1st year students were very happy to hear that our next instructor was to be ‘smiling’ master Shoji. Our joy was short-lived. 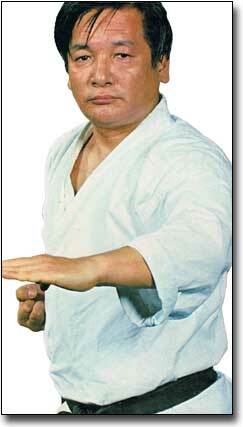 Shoji Sensei’s training was much harder with many hundreds of repetitions of the Karate basics. In morning training sessions after about one hour of a particular Karate technique, Shoji Sensei called out “Saigo” which means “Last”. We thought he meant “Last 10 times” so we gathered our energy and did another 10, thinking it would be the last. However, to our pain and amazement he kept counting! This happened all the time. At first I thought I misheard him, but my colleagues also heard Shoji Sensei say “Saigo”. His “Saigo” became an important topic among us, whether he tricked us or what he was saying was some other word. We started paying attention and found that he was actually saying “Sah iko”, which means in Japanese “Let’s go!”. An hour of Karate Basics was a warm-up for him. ...but Karate Legends Eat ! Shoji Sensei had already become one of JKA’s Karate legends. He had won the All Japan Championships twice with the Shotokan Karate kata Unsu. We were in awe and scared to talk to him. 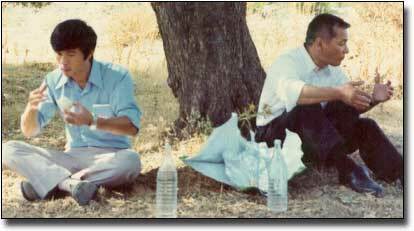 This shot from the early 1970's shows Karate Master Shoji (right) and his student Takaatsu Nishimura "eating fast" somewhere in Greece. As we moved on in the university karate club, we had more opportunities to speak to him through the annual gasshuku and visits to his home. We found him very approachable despite his high achievements. Shoji Sensei and Mrs. Shoji always warmly welcomed us students at his home. "One of the things I clearly remember most about Shoji Sensei is the incredible speed at which he ate...!" At training camps, we ate together in a big dining room. The 1st year students served rice for instructors, old boys and seniors. There were over 100 members so we were always busy serving those above us. When we were finished serving and ready to eat, the call came “Seiza” to finish because Shoji Sensei had already eaten and was ready to leave! In 1996 we had the opportunity to train with Shoji Sensei in Melbourne. Everyone enjoyed not only his teaching (still many repetitions of Karate basics and Shotokan Karate kata), but also his warm personality. Sensei wanted to see the Milky Way in the Australian night sky but this was not possible due to bad weather. When he was leaving Melbourne, I asked him to visit again, so that he could see the Milky Way next time. He replied that this would be his last overseas trip. Shoji Sensei did not talk much. He was quiet and shy. He did not seek the spotlight. Despite his paramount achievements in Karate, Shoji Sensei was very humble. I always looked forward to visiting him when I went back to Japan. I usually prepared a long list of questions about Karate before my visits. We normally got sidetracked in our conversation and many questions were left unasked. Whenever I had a question I always had him as my mentor to answer or confirm my line of thought. Now he is gone, I will miss him not just as my university Karate master but also as a person for whom I had a great respect. I visited Shoji Sensei at his Tokyo home in early July this year (2003). As usual we talked about various things - mainly Karate. This was to be my last time with him. I am extremely grateful that I had the opportunity of learning from one of Japan’s Karate legends. May his soul rest in peace. The Japan Karate Association held the first All Japan Karatedo Championship Tournament at the Tokyo Metropolitan Gymnasium on October 28, 1957 to confidently show the unprecedentedly large scale Karatedo events, the fruits of many years preparation. On that day the place was packed with as many as eight thousand spectators and turned into a scene of wild enthusiasm and excitement because of the wonderful performances staged by many Karate players. It was Mr. Hiroshi Shoji who fascinated the spectators fully by his excellent performances, full of power and beauty and successfully won the Kata championship. 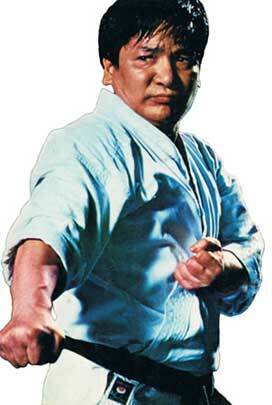 The manner of Mr. Shoji's Karate is, as his personality indicates, never "showy", always serious, sharp and accurate. He has "something indescribably appealing". Mr. Shoji, after graduating from Takushoku University, has devoted himself to Karatedo. While attaining his own extensive growth in spirit and skill, he also contributed to the expansion of the Japan Karate Association through his steady activities. It should be appreciated that his leadership has turned out a number of great Karate men now forming the leading group in Karate circles. Moreover, it should be borne in mind that his excellent personality has had a great influence on many Karate men. Modest as he is, he is the sort of man who improves on acquaintance just like genuine Sake (rice-wine) which tastes better as you drink more of it. "Unsu" is his favourite Shotokan Karate Kata together with "Kanku Sho". As is well known, "Unsu" is very difficult to perform, strength and accuracy is demanded while executing the rapid changing movements. In this book however, he has successfully given easy and systematic descriptions. I highly appreciate the efforts he has made. To publish a book of this nature is laborious work but it is very useful for ones own development. I hope that he will achieve further greatness in the future. From the Preface of the Shotokan Karate Kata Book "Unsu"
"An invaluable contribution to the existing literature on Karate"
Mr. Shoji won the All Japan Karatedo Championships a number of times through his flawless demonstrations of "Unsu", a Shotokan Karate Kata which represents the combination of techniques compiled over hundreds of years by countless masters of the art. The All Japan Championship demands athletes of such extensive ability, that those participating in it represent a large majority of the world's Karate masters. It is out of his experience with this elite company that Mr. Shoji writes this book. The recent worldwide popularity of Karate has been a great lift for the 'sport'. However, some people fail to realise the principles of Karate and its values for humanity. All readers should approach this book, not only for its concepts and physical worth, but also in quest of the spiritual essence which is the soul of Karatedo. 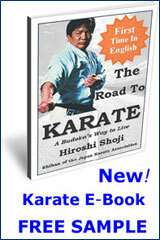 Karate Master Hiroshi Shoji is one of Japan’s Karate Legends. 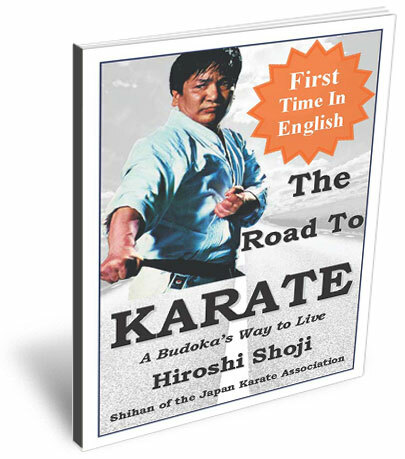 His 1976 book “The Road to Karate – a Budoka’s Way to Live” is a living piece of Shotokan Karate history. This unique work is NOW AVAIALABLE FOR THE FIRST TIME in English as an E-Book exclusively here at Dynamic Karate! Who Are Your Karate Legends? - Who are the Karate guys that have blown you away..? - Was it your first Instructor..? - Maybe you've met or trained with many famous Karate Legends. ...tell us about them and why they deserve to be called Karate Legends..? TIP: Since most people scan Web pages, so include your best thoughts in your first paragraph. Want to add some pictures or graphics..? Copyright © 2010-16 dynamic-karate.com All rights reserved. No reproduction without permission.